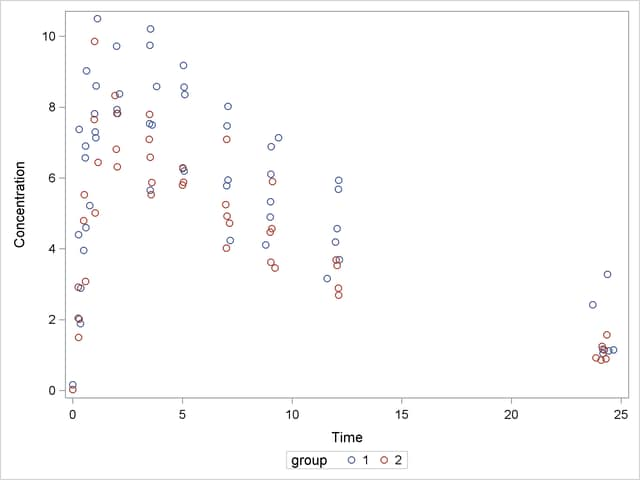 When you model nonlinear trends in the presence of group (classification) variables, two questions often arise: whether the trends should be varied by group, and how to decide which parameters should be varied across groups. A large battery of tools is available on linear statistical models to test hypotheses involving the model parameters, especially to test linear hypotheses. To test similar hypotheses in nonlinear models, you can draw on analogous tools. Especially important in this regard are comparisons of nested models by contrasting their residual sums of squares. In this example, a two-group model from a pharmacokinetic application is fit to data that are in part based on the theophylline data from Pinheiro and Bates (1995) and the first example in the documentation for the NLMIXED procedure. In a pharmacokinetic application you study how a drug is dispersed through a living organism. The following data represent concentrations of the drug theophylline over a 25-hour period following oral administration. The data are derived by collapsing and averaging the subject-specific data from Pinheiro and Bates (1995) in a particular, yet unimportant, way. The purpose of arranging the data in this way is purely to demonstrate the methodology. The following code plots the theophylline concentration data over time for the two groups (Output 62.5.1). In each group the concentration tends to rise sharply right after the drug is administered, followed by a prolonged tapering of the concentration. In between these two extremes lie other models, such as a model where both groups have the same absorption and elimination rate, but different clearances. The question then becomes how to go about building a model in an organized manner. where are the number of observations used and are the number of parameters in the full model. The numerator of the statistic is the average reduction in residual sum of squares per constraint. The mean squared error of the full model is used to scale this average because it is less likely to be a biased estimator of the residual variance than the variance estimate from a constrained (reduced) model. The statistic is then compared against quantiles from an distribution with numerator and denominator degrees of freedom. Schabenberger and Pierce (2002) discuss the justification for this test and compare it to other tests in nonlinear models. If you fail to reject this hypothesis, there is no need to further examine individual parameter differences. The clearance, the rates, and the mean function are formed independently of the group membership. The analysis of variance table is saved to the data set aovred, and some of its variables are renamed. This is done so that the data set can be merged easily with the analysis of variance table for the full model (see following). The converged model has a residual sum of square of and a mean squared error of (Output 62.5.2). The table of parameter estimates gives the values for the estimated log clearance , the estimated log absorption rate , and the estimated log elimination rate . Separate parameters for the groups are now specified in the PARMS statement, and the value of the model variables cl, ka, and ke is assigned conditional on the group membership of an observation. Notice that the same expression as in the previous run can be used to model the mean function. The results from this PROC NLIN run are shown in Output 62.5.3. The residual sum of squares in the full model is only , compared to in the reduced model (Output 62.5.3). In the preceding statements, the parameters in the second group were expressed using offsets from parameters in the first group. For example, the parameter beta1_diff measures the change in log clearance between group 2 and group 1. This simple reparameterization does not affect the model fit. The analysis of variance tables in Output 62.5.5 and Output 62.5.3 are identical. It does, however, affect the interpretation of the estimated quantities. 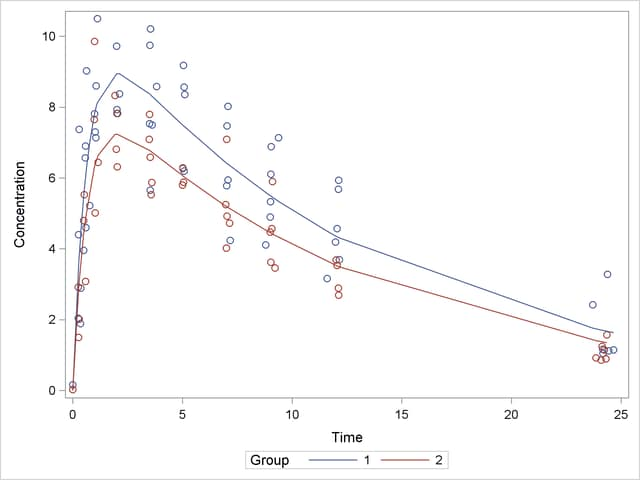 Since the parameter beta1_diff measures the change in the log clearance rates between the groups, you can use the approximate 95% confidence limits in Output 62.5.5 to assess whether that quantity in the pharmacokinetic equation varies between groups. Only the confidence interval for the difference in the log clearances excludes 0. The intervals for beta2_diff and beta3_diff include 0. The results for this model with common absorption and elimination rates are shown in Output 62.5.6. The sum-of-squares reduction test comparing this model against the full model with six parameters shows—as expected—that the full model does not fit the data significantly better ( , Output 62.5.7). The plot is shown in Output 62.5.8. The sum-of-squares reduction test is not the only possibility of performing linear-model style hypothesis testing in nonlinear models. You can also perform Wald-type testing of linear hypotheses about the parameter estimates. See Example 40.17 in Chapter 40, The GLIMMIX Procedure, for an application of this example that uses the NLIN and GLIMMIX procedures to compare the parameters across groups and adjusts p-values for multiplicity.